The Raider series of outboards are dedicated to the initial WW II Marine Raiders. 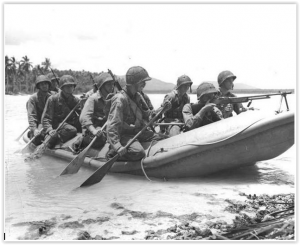 The Raiders were formed by elite units established by the United States Marine Corps during World War II to conduct amphibious light infantry warfare, landing in rubber boats and operating behind enemy lines. The Raiders were disbanded on 8 January 1944 when the Corps made the doctrinal decision that the Raiders had outlived their original mission. However, most combat veterans see the Raiders as “an elite force within an elite force, and many considered the first SEAL’s. The Marines recently reactivated the Raiders at Camp Lejeune and Camp Pendleton. The Raider development was funded by USSOCOM under a full and open contract by PEO Maritime. Raider Outboards, Inc. is a-US owned and operated company based in Central Florida – near Kennedy Space Center, located in the Space Port Commerce Park. We design and produce multi-fuel, submersible, lightweight outboard motors and associated parts that include a Safety Jet; transom plates; carts and transportation cages. Our markets include military; Search & Rescue and commercial/retail. The Raider, patent pending, Safety Jet can be purchased in a kit which retrofits a propeller drive outboard motor system to a jet pump system. The Safety Jet was designed for safety for swimmers and divers in training situations. The Safety Jet drive system is excellent for “brown” water operations where search and rescue missions happen. For missions that has rocks/coral the Safety Jet can absorb hits that ruin propellers. Raider also provides a series of transom plates that are attached to the Rubber Inflatable Boat. The transom plates have single and dual motors configurations. The transom plates provide centerline alignment and safety if the motor clamps loosen under vibration. Speciality items like extended handles, extended fuel hose connections, outboard motors carts and transportation cages are also available. Raider builds and supports reliable outboard motors for the warfighter. Outboards designed for missions by simplicity. Completed missions and come home. We design features in the outboards to provide redundancy; minimize electronics; increase reliability; utilize designs that have been proven in the field. We are all about service to our customers. Our mission is to develop the most reliable and easy to maintain outboard engine that can perform in difficult and demanding missions. The Raider Outboards can withstand air drops and submarine launches to enable the warfighters to do their mission and come home. Raider provides is the leader in horsepower to weight ratio. Raider 50 gets 25% better fuel efficiency than any other outboard motor in its class.